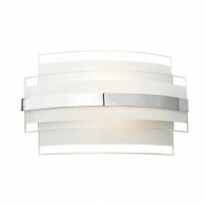 73244The Alcor LED wall light is finished in a tex..
73245A contemporary LED wall light with a modern c..
2011-WBA 1 light curved glass wall fitting. Dimmab..
67080Cassa is an LED wall light which gives a subt..
67082Cassa is an LED wall light which gives a subt..
20010-WBCHA wall light in a polished chrome finish..
6002CCClover Led Curved Wall Bracket, Clear Crysta..
6001CCClover Led Wall Bracket, Clear Crystal, Chro..
3462-2CRDrum Pleat - 2 Light Wall Bracket, Cream P..
3462-2SIDrum Pleat - 2 Light Wall Bracket, Silver ..
UG-WB-XAn unglazed ceramic wall light, perfect for..
EVERETT-1WBCHIndoor wall light finished in chrome ..
FARGO-WBBPThe Fargo wall is finished in brass effe..
FARGO-WBCHThe Fargo wall is finished in chrome eff..
051-WBSCThe Firenz wall light has a satin chrome e..
36097AMFlush Tiffany Glass Wall Bracket Dish - Amb..
2018-WBGlass and chrome finish wall light with pul..
73418A simple up and down LED wall light with a cl..
8721Gypsum G9 Oval White Plaster Wall LightThis cl..
8436Gypsum G9 White Curved Cylinder Plaster Wall L..
UG-WB-GAn unglazed ceramic wall light perfect for ..
70559A 2 light wall fitting made of crystal beads ..
HUDSON-2WBCHA 2 light wall fitting is made of crys..
71308The Indara wall light features a hammered age..
61032LED wall light finished in matt white, which ..
61031LED wall light finished in polished aluminium..
JOHNSON-WHThe Johnson LED wall light is finished i..
JOHNSON-CHThe Johnson LED wall light is finished i..
MARCONI-2WBDAA 2 light wall fitting with mosaic ef..
MARCONI-2WBLIA 2 light wall fitting with mosaic ef..
MARCONI-2WBCHA 2 light wall fitting with mosaic ef..
MARCONI-2WBNAA 2 light wall fitting with mosaic ef..
61234An LED wall light finished in a brushed alumi..
61235An LED wall light finished in a brushed alumi..
UG-WB-7An uplighter wall light with a natural ungl..
55595The Moro is a stylish LED wall light which of..
70335A simple wall light comprising of a semi circ..
70334A simple wall light comprising of a semi circ..
095-20A single curved glass wall light combining c..
UG-WB-AA ceramic half moon wall light perfect for ..
633-WBGlass semi circle wall light offering an upw..
61684Indoor wall light finished with garden detail..
6711-2CCSigma 2 Light Chrome Clear Acrylic Wall Br..
3352-2CCSpindle - Led & 2 Light Wall Bracket, Chro..
67087The Verona flexi arm wall light is finished i..
67089The Verona wall light is finished in matt whi..
67090The Verona wall light is finished in polished..
0882SSAdjustable Wall - 2 Light Wall Bracket, Sati..
0991SSAdjustable Wall - 2 Light Wall Bracket, Sati..
1901SSHalf Moon Led Wall Bracket, Satin Silver, Fr..
3209ABLed Uplight Wall Bracket, Antique Brass, Fro..
2209ABLed Uplight Wall Bracket, Antique Brass, Fro..
3209CCLed Uplight Wall Bracket, Chrome, Frosted Gl..
2209CCLed Uplight Wall Bracket, Chrome, Frosted Gl..
3209SSLed Uplight Wall Bracket, Satin Silver, Fros..
2209SSLed Uplight Wall Bracket, Satin Silver, Fros..
3309WHLed Wall Bracket, WhiteAdd a modern and styl..
1781CCRectangle Led Wall Bracket, Chrome, Frosted ..
3370WH Led Ring Wall Bracket, White, Frosted Acryl..
3370CC Led Ring Wall Bracket, Chrome, Frosted Acry..
102White Ceramic Uplighter Which Is PaintableThis ..
1087Wall Light - 1 Light Wall Bracket, Chrome, Fro..
3837Wall Light - Brown Leaf Wall Washer Scavo Glas..
1837Wall Light - Brown Wall Washer - Scavo GlassBr..
30002Wall Light - Half Wall Washer Antique/scavo G..
2691CCWall Light 1 Light Chrome/glass Circular G9..
2692CCWall Light 1 Light Chrome/glass Half CircleT..
106Ceramic Wall Light Bombay - Dia 30cm UplighterT..
1752CCLed Wall Light 10w Chrome Up/downlightThis C..
6482CCLed Wall Light Oval Layered Wall Bracket, C..
3773Led Wall Light - 16xled, Chrome, Mirror Edge,..
1953SSLed Wall Light 2 Light 10w Satin Silver Up/d..
4274White Rectangle Plaster Wall LightThis classic..
6201BKWall Mirror Light - Deco Fan Style BlackThis..
6201Wall Mirror Light - Deco Fan Style FrostedThis..
2017-WBSimple glass wall light with pull cord swit..
WELLES-1WBABThe Welles wall light has an antique b..
WELLES-1WBSCThe Welles wall light has a satin nick..
2492-2BRAlmandite - 2 Light Wall Bracket, Brown Go..
2492-2CRAlmandite - 2 Light Wall Bracket, Cream Go..
Caprice 160Our LED range is in high demandThe Capr..
Caprice 260Our LED range is in high demandThe Capr..
Caprice 430Our LED range is in high demandThe Capr..
39629Exquisite, glamorous and chic the Crystal wal..
Roma - Led Reading Light • Super slim & elegan..
Sienna - Led Reading & Wall Light • Super slim..
Vienna - Led Reading & Wall LightSuper slim &a..
Gemini 180/12w LEDThe Gemini 180 part of the&..
Gemini 180/8w LEDThe Gemini 180 part of the&n..
Gemini 200 LEDThe Gemini 200 part of the .. The Lynx 100 LED Wall Washer LightsThe Lynx 100 is.. The Lynx 200 LED Wall Washer LightsThe Lynx 200 is.. The Lynx 370 LED Wall Washer LightsThe Lynx 370 is..
13915The Doron twin wall light is perfect for any ..
61836The Tuscana is a die cast aluminium alloy gui..
61837The Tuscana is a die cast aluminium alloy gui..
64744The Vulcan is a curved LED die cast aluminium..
64745The Vulcan is a curved LED die cast aluminium..
61865The Vulcan is a curved LED die cast aluminium..
61866The Vulcan is a curved LED die cast aluminium..
Are you looking to purchase a wall washer or a set of wall lights for your home? We are one the most popular sellers of wall washers in the United Kingdom! Visit one of our branches or look online to purchase one of the possible best wall lights in the South West. Our range of wall washers incorporates a variety of styles and different finishes. Now featuring our latest LED wall washers - promoting a sleek and stylish feel. Our aim is to make our customers happy, if you're lost for choice or need a hand in choosing the right one for you please contact us either online with the instant chat or pop instore.